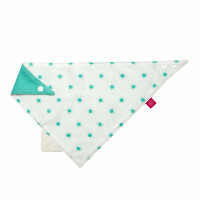 Product information "Bandana with silicone teether"
description & equipment Cheerfully colored, soft and easy-care. 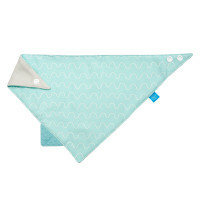 The three-layered bandanas for babies and toddlers made of muslin are 100 percent cotton and pleasantly soft. They are reversible and easy to close with snap buttons. The wash-n-wear bandanas are available in different designs for boys and girls. Thanks to a plain-colored and a printed side, they can always be fashionably combined to complete every outfit.